Red Pepper editors in the dock. Courtesy photo. KAMPALA–The Buganda Road Magistrate Court is Tuesday morning expected to start hearing the bail application filed by the five directors and three editors of the Red Pepper Publication Ltd. The directors and the editors were last week charged with seven counts – in relation to publication of information prejudicial to national security; criminal libel and offensive communication. Court started to hear their application last week when they appeared for the first time still in court. 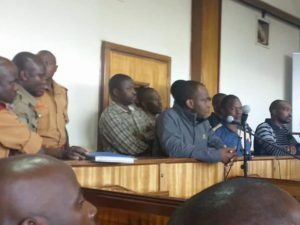 Their lawyers Max Mutabingwa, Geoffrey Kandeebe and Dennis Nyombi, applied for bail but the directors and the editors were sent to Luzira Prison until tomorrow when the court will give a ruling on the application after prosecution made objections. Two weeks ago, the directors of the local tabloid and the editors were detained at Nalufenya Police station, after Police cordoned off their head office as a crime of scene at Namanve, Mukono Municipality. The premises are still closed to date. Those detained are Managing Director, Richard Tusiime; Editorial Director, Rugyendo Arinaitwe; general manager, Francis Tumusiime; general manager, Johnson Musinguzi; the Chief Finance Officer and Patrick Mugumya, the Chief Operations officer and James Mujuni, the Chief Commercial Officer. The state accuses them of publishing an article on November 20 2017, pointing at President Museveni, his brother Gen. Salim Saleh and Security minister Lt. Gen. Tumukunde for plotting to throw the government of President Kagame. The information, according to the charge sheet, the information injured the reputation of the President and Gen. Saleh. Their sureties are Richard Muhangi, Edwin Muzahura, Obed Akiriho, Alex. B. Atuhaire and Giles Muhame, among others. Since last week, Red Pepper and other products published by the same media house have not been on the market. The radio station, Juice FM and the online publication were also shut down. “The Red Pepper offices are a scene of crime and it has been cordoned off, to facilitate these investigations and remain as long as it’s necessary,” said Emilian Kayima, the Police spokesperson. Many journalists and media houses are living in fear, since CMI started to arrest some top Police officials. Some have been summoned to appear before CID Police headquarters, Kibuli for interrogations on issues related to infringing the peace of IGP Gen Kale Kayihura.